Ackermann’s Repository of Arts, November 1817. Though I find the head-dress odd, I think the rest of the ensemble is quite pretty. 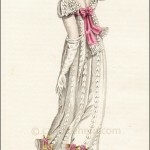 But it is the exquisite rendering of the lace flounces in the engraving that makes this print stand out to me. It is unfortunate that both the artist and the engraver remain unknown to us. 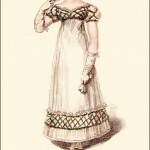 One wonders why the beautiful lace is not allowed to be described in the description below. 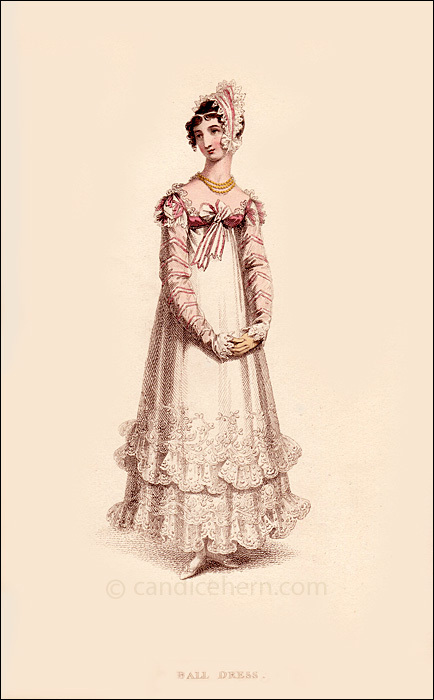 This is the period during which the bodice became teeny tiny, and the flounces and other ornamentation of the skirt rose higher and higher. It makes one wonder if all the attention was drawn to the skirt so that people wouldn’t notice how skimpy the bodice was!